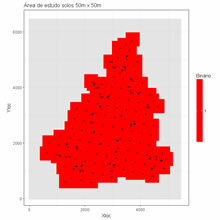 Create a 2D grid mask from sample data and a maximum distance. Estimation of a grid mesh by using the estimator inverse of power distance. 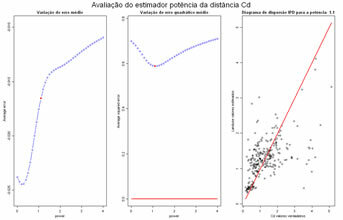 Cross validation test for estimation using the inverse of power distance, powers can range between a minimim and a maximum value, error and squared error are computed for each power and represented graphically, and the best power can be evaluated. 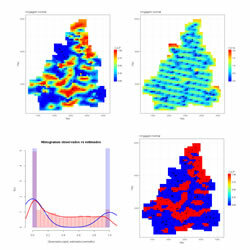 Demo of ordinary and simple kriging, inititate a simple configuration of samples and perform kriging of an unknown location to evaluate kriging weights, and estimated value. Cross validation test by using Simple Kriging or Ordinary Kriging. 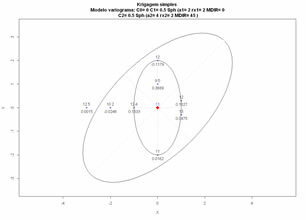 Values are estimated in the samples locations, and errors (simple and squared) are computed. 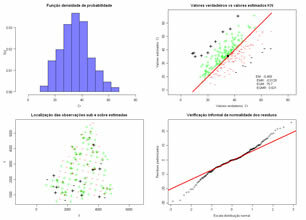 Two graphics show estimation errors, first a scatterplot of true values vs estimated values and then underestimated and overestimated locations are displayed. Estimation of a mesh of locations by using Simple Kriging or Ordinary Kriging. 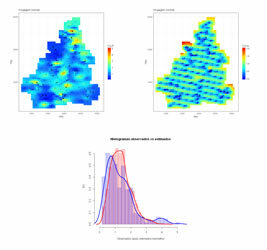 Three graphics show estimation results, the first is the estimated map of values, the second is the kriging variance map and the third displays two histograms, one of the sample data and another of the estimated values. Visualization of previously estimated images by inverse of power distance or kriging.